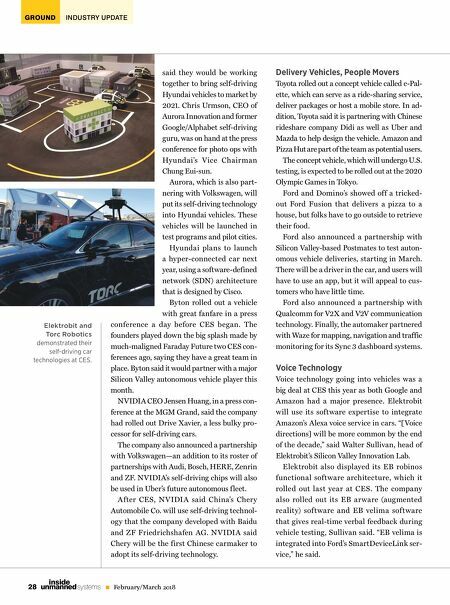 GROUND INDUSTRY UPDATE 28 February/March 2018 unmanned systems inside said they would be working together to bring self-driving Hyundai vehicles to market by 2021. Chris Urmson, CEO of Aurora Innovation and former Google/Alphabet self-driving guru, was on hand at the press conference for photo ops with Hy undai's Vice Chairman Chung Eui-sun. Aurora, which is also part- nering with Volkswagen, will put its self-driving technology into Hyundai vehicles. These vehicles will be launched in test programs and pilot cities. 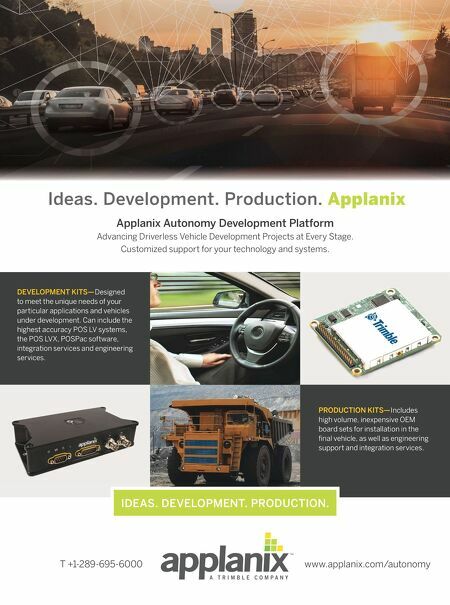 Hyundai plans to launch a hyper-connected car next year, using a software-defined network (SDN) architecture that is designed by Cisco. Byton rolled out a vehicle with great fanfare in a press conference a day before CES began. The founders played down the big splash made by much-maligned Faraday Future two CES con- ferences ago, saying they have a great team in place. Byton said it would partner with a major Silicon Valley autonomous vehicle player this month. NVIDIA CEO Jensen Huang, in a press con- ference at the MGM Grand, said the company had rolled out Drive Xavier, a less bulky pro- cessor for self-driving cars. The company also announced a partnership with Volkswagen—an addition to its roster of partnerships with Audi, Bosch, HERE, Zenrin and ZF. NVIDIA's self-driving chips will also be used in Uber's future autonomous f leet. After CES, N VIDIA said China's Chery Automobile Co. will use self-driving technol- ogy that the company developed with Baidu and ZF Friedrichshafen AG. N VIDIA said Chery will be the first Chinese carmaker to adopt its self-driving technology. Delivery Vehicles, People Movers Toyota rolled out a concept vehicle called e-Pal- ette, which can serve as a ride-sharing service, deliver packages or host a mobile store. In ad- dition, Toyota said it is partnering with Chinese rideshare company Didi as well as Uber and Mazda to help design the vehicle. Amazon and Pizza Hut are part of the team as potential users. The concept vehicle, which will undergo U.S. testing, is expected to be rolled out at the 2020 Olympic Games in Tokyo. Ford and Domino's showed off a tricked- out Ford Fusion that delivers a pizza to a house, but folks have to go outside to retrieve their food. Ford also announced a partnership with Silicon Valley-based Postmates to test auton- omous vehicle deliveries, starting in March. There will be a driver in the car, and users will have to use an app, but it will appeal to cus- tomers who have little time. Ford also announced a partnership with Qualcomm for V2X and V2V communication technology. Finally, the automaker partnered with Waze for mapping, navigation and traffic monitoring for its Sync 3 dashboard systems. Voice Technology Voice technology going into vehicles was a big deal at CES this year as both Google and Amazon had a major presence. Elektrobit will use its software expertise to integrate Amazon's Alexa voice service in cars. "[Voice directions] will be more common by the end of the decade," said Walter Sullivan, head of Elektrobit's Silicon Valley Innovation Lab. Elektrobit also displayed its EB robinos functional software architecture, which it rolled out last year at CES. The company also rolled out its EB ar ware (augmented reality) software and EB velima software that gives real-time verbal feedback during vehicle testing, Sullivan said. "EB velima is integrated into Ford's SmartDeviceLink ser- vice," he said. Elektrobit and Torc Robotics demonstrated their self-driving car technologies at CES.